We went big and still went home. Dave, KC9FQD, and I setup a 50-1296 Mhz station on top of Rib Mountain in EN54dw. The view/path was great to the north but paths to everywhere else were terrible. Combine this with poor conditions, S9 noise on 2m, sleet/rain, and 40MPH 50F degree winds and you get the biggest contest flop ever. I arrived home from the EN54 multi-op at around 5pm. 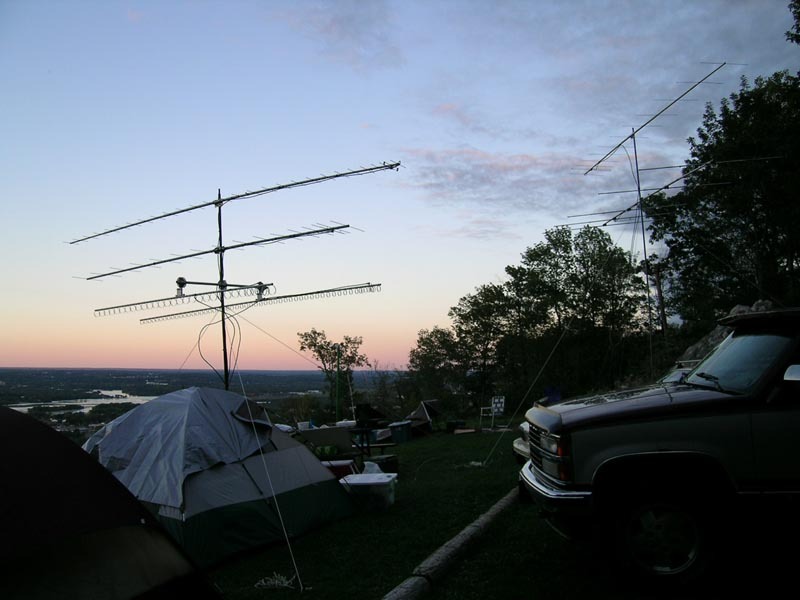 I setup my IC-746 and operated for about three hours from my home QTH. Conditions seemed good and activity was much better than from EN54. 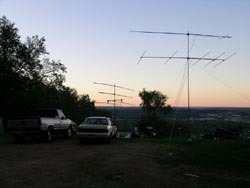 Only 2 less Q's on 2m in three hours verses 23 hours on top of Rib Mountain. What a blast! 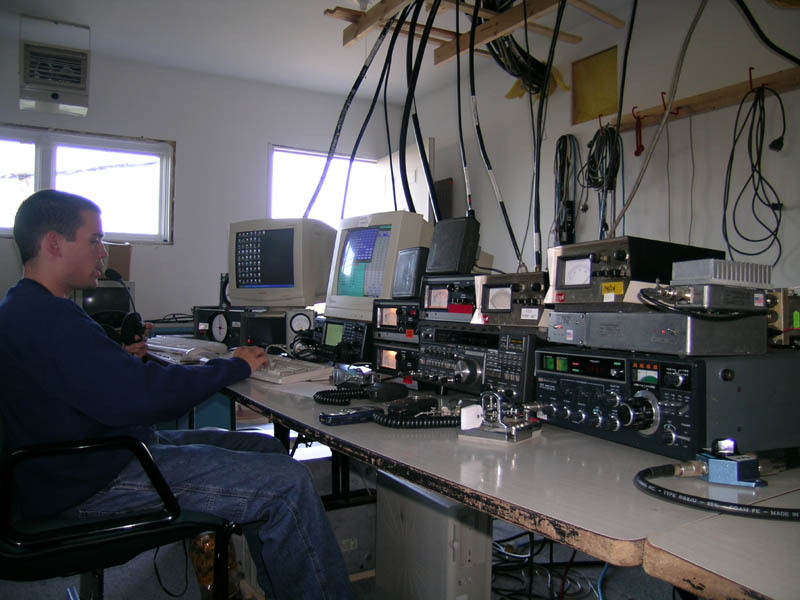 I was fortunate to operate from the W0AIH/W0UC contest shack again this year. W0AIH and I have been slowly fixing antennae and replacing coax over the past couple of summers. Despite our work, the system as a whole deteriorated since last summer. 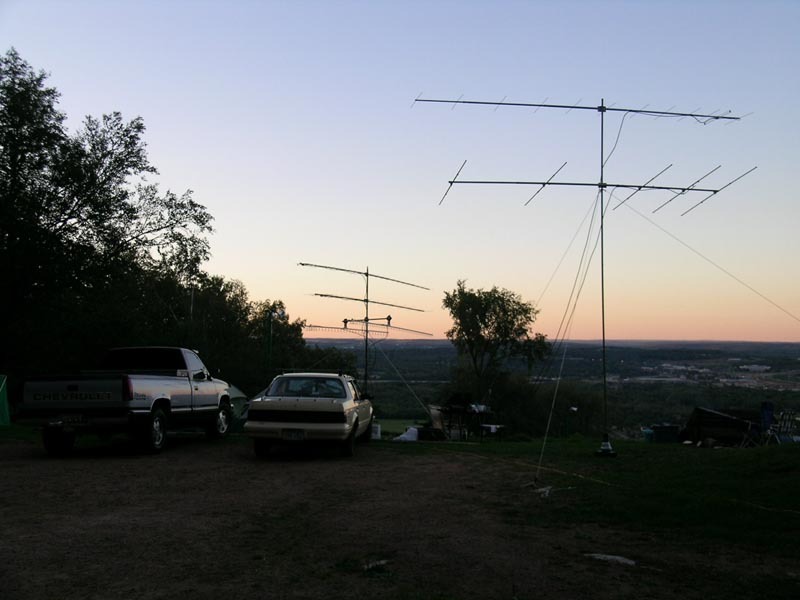 Only two antennae on 6M were working and the 432 and 222 stack rotors did not indicate headings. I tried to troubleshoot the problems at the start of the contest but soon abandoned those activities when I discovered there was Es to work! I heard KC0IYT/R and KC9GIQ on 432 at 1800z so I quickly nabbed them and took them to 2M. I then switched to 6M and found a somewhat clear frequency at 50.171.3. I called CQ a couple times and instantly had a small pile-up. I had 10 Q's in the first 3 minutes. 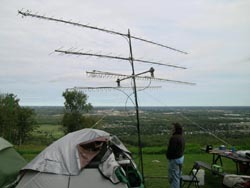 The two antennae I used were the 8 element @ 40 feet and a 6 element fixed to the SW. I turned the 8 element SE and alternated between yagis during CQ's. 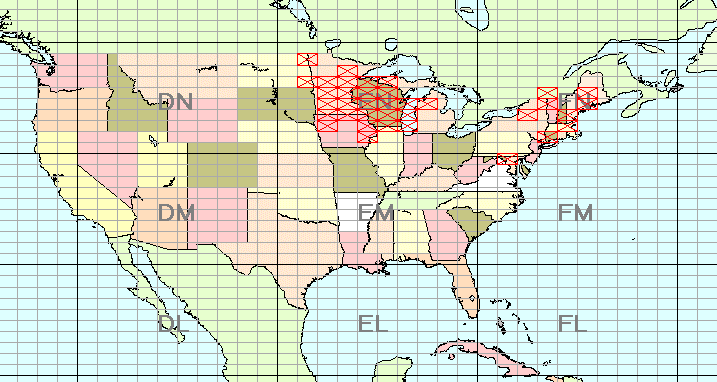 I was running CA, WA, and ID stations from one yagi while working east coast stuff on the other. I felt loud and continued to run stations. The west coast stuff petered out and at 1900z the band shifted from the SE to the E. The band sounded like 20M during a WPX SSB contest, just how I like it. It was tough keeping my run frequency as high power guys kept jumping on near me. I would sometimes turn my microphone gain up a little bit and give a long CQ. It is amazing how this helped clear the frequency up. Signals were so strong that I ran most of my pile-ups with the 20dB attenuator on. At 2013z, I had my max 10 QSO rate of 314 Q's/hour (6 Q's a minute) and my 100 QSO rate was around 230 Q's an hour. I was monitoring 2M while running my pile and heard some commotion at 2213z. I switch my main rig to 2M and heard some EN34 guys working W1's. I quickly swung my yagi around to the east and worked 12 Q's from W1, W2, and VE2. K1WHS was 30 over! The 20-minute opening supplied some awesome mults but really hurt my rate. I stuck to my motto, "If you're not CQ'ing, you're not winning" and jumped back on 6M. I was already over 500 QSO's on 6M and was shooting for 200 more.  K2DRH, N9ISN, and N0AKC would occasionally jump in and we would exchange QSO totals. Both were right behind my heels. This pushed me to contest even harder. Rates were continually above 100 Q's an hour up until around 0100z when the band started to fade. I was at 900 Q's by the end of the night. Would 1000 Q's be possible? Sunday was never quite like Saturday. 6M opened early at 1300z to the NNE. The VE2YAT/B in FO40 was in for most of the morning. 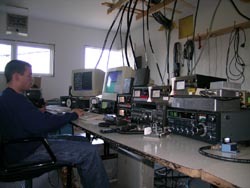 I worked new stations in VE1, VE2, VE9, VY2, and northern W1. K7BV/1 and W1JJ operating portable from FN64 as W1VHF were especially loud! At 1600z, the band shifted from the NNE to the S and SE. Signals were loud from those directions but there were few new stations to work. At 1640z, I worked WB4ZXK EM66 for QSO #1000! Since new stations we few and far between, I hit the "high bands" hard on Sunday afternoon. My 902 and 1296 systems were not working properly. The only QSO from out of EN44 was with K2DRH on 1296. Bob's system is amazing! 6 meters remained open for most of Sunday night. K5AM, WA7JTM, W5LCC, and AA7A were S9 up until the end of the contest. 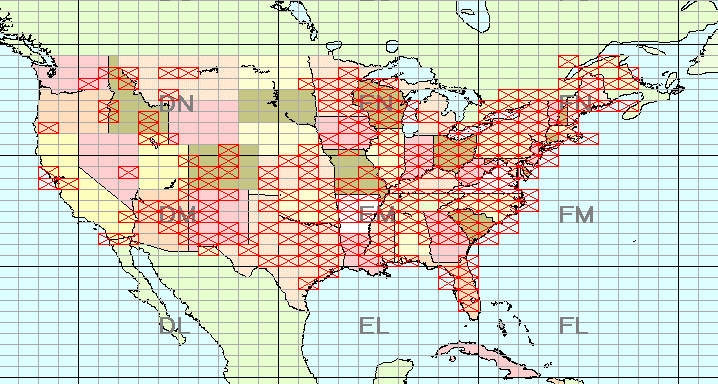 When the clocked ticked 0300Z, I had an incredible 1107 QSO's and 229 grids on 6m. I crushed my previous high and was the first Single Op to break the 1K Q barrier! Simply amazing! New claimed WI SOLP section record! 1st SOLP to break 1000 Q's on 50 Mhz! I again brought all my equipment to the hilltop QTH of W0UC/W0AIH to utilize Paul's arsenal of antennae. Setup went smoothly and all antennae remained in working order since the 2005 August UHF contest. Except for a few 5-minute long tropo enhancements, conditions remained poor throughout the contest. It wasn’t rare to auto-CQ for up 30 minutes to an hour with no replies and it took lots of work to bag those KW Big Guns out east. Even though conditions were poor it seemed activity was up in the Midwest. Many new stations were put in the log! See you guys in June!